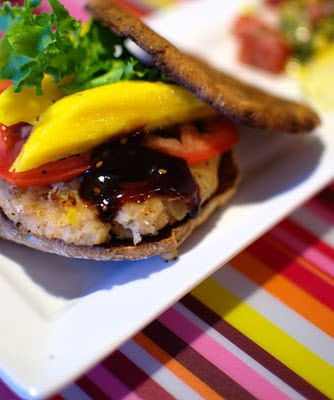 Burgers are great but fish burgers are even better. We mixed cod, garlic, basil, shredded coconut, fish sauce, hoisin sauce and chilli flakes in the food processor. You can add an egg but it is not necessary. You could use any type of fish as long as it is a fairly thick fish. The dressing sauce was made by mixing hoisin sauce and ketchup. We topped the burgers with mango, tomatoes and escarole. A very nice alternative to ground beef.